Sometimes life is better the second time around. 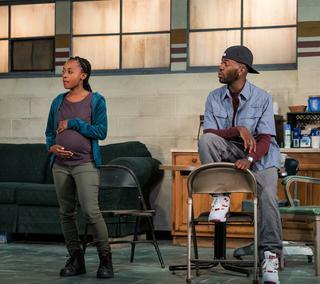 This is the second time in exactly a year that I’ve seen a production regionally of this play, part of a trilogy of plays about the decline of the city of Detroit, Michigan. I liked it fine last July in Chester, Massachusetts, and I like it even more this time in Dorset, Vermont. Two different casts, two different directors and design teams clearly make a difference overall, or perhaps it is just me coming to a new play with a bit of understanding and knowledge acquired earlier. This time around, what was a good play is suddenly a rare gem. The play tells four separate stories that just happen to overlap because the four principals happen to work together. While each of the four characters appears in one another’s personal tales, they are not what it’s about at any particular turn. In spite of the simultaneous life tales, this play really deals with the ideas of community, of union, of strength and of need. Morisseau has captured, as a camera does with its high-speed film, the essence of each life and, like the character of Alice falling down the rabbit hole, all four protagonists and each character finds small wonders along their downward journeys. Let’s say that the principal story is Faye’s journey. A long-term employee of the stamping factory, she is also the union representative for the UAW. She is the elder statesman in the break room, the woman who knows how things function and how to get things done right, and right in time. 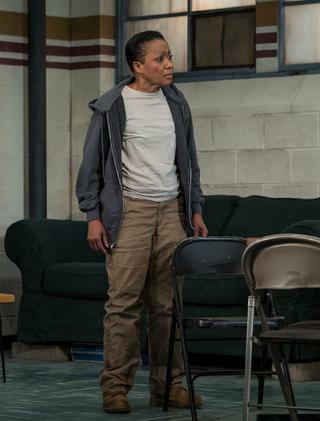 She is played by Brenda Pressley, who turns the role into a multi-folded napkin that opens, layer by layer, to reveal her own secrets and those of her compatriots. When she is on stage, she is center-stage. Pressley plays with conviction and strength and communicates perfectly just how things need to be. She is a brilliant portrayer of the woman she plays: a lesbian grandmother rejected for her honesty in spite of her genuinely loving nature. There is no one she is not willing to protect, to go to bat for, to urge forward when necessary. Pressley is so consistent in her stubborn refusal for Faye to be less than on top of things that, in those moments in the play when her own troubled weakness is revealed, it is done with a dignity that imparts personal strength to a moment of defeat. I loved how she played this. As her younger counterpart, the pregnant Shanita, who is determined to work up until the day she gives birth, Mirirai Sithole is funny, sweet, engaging and delightful. She plays this role for its least romantic image and emerges the heroine of her own story with grace and ease. She is a true comedic actress whose sense of the comic never overrides her sense of the dramatic. As a result, her Shanita is a remarkable figure whose related dreams never fail to intrigue her listeners and never fail to force others to consider her plight as just another part of her job. Leland Fowler plays Dez, a hot-headed young man whose story is one of dreams and implied crimes. Dez is not who and what he often seems to be, and instead is a romantic fool who has no idea what that is or how to be it. Fowler plays internal confusion really well. He brings an edginess to the play that makes him stand out even when he’s sitting down and changing his shoes. You watch him waiting for a “shoe to drop” moment, convinced its coming. Fowler surprises with every choice he makes as an actor and this brings Dez a remarkable reality. Fourth but not least is Reggie, who supervises the operation these three work in. 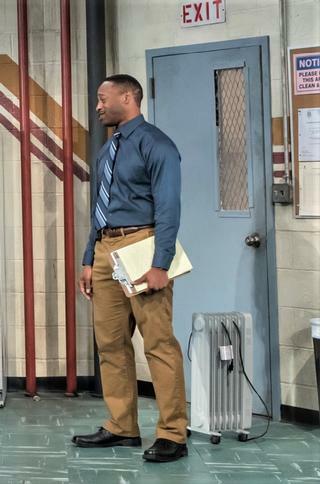 He is Faye’s closest companion in the workplace; they started together and Reggie has gone up the line while she has remained in place. The son of her oldest friend, now deceased, he has never lost his sense of moral commitment to Faye and his dedication to the concept of family. He has a family at home but he also has one in the factory, and there Faye is his counterpart on more than one level. At his worst, Reggie is committed to the bosses but, at his best, he is committed to her. He is played with integrity and honesty by Gabriel Lawrence, who truly seems to be living the role on stage. His emotional openness in this part is a gift to receive by the audience. I literally wanted to thank him for stepping up and defending “us,” which, of course, is not what happens, but it felt like it had. This is the level of honest acting in this show. Perhaps the biggest difference from last year is the direction of the play by Jade King Carroll. I do not know her work, but I hope I continue to see what she brings to the stage. The ease of these characters in communicating with one another, the seeming knowledge or understanding of one another’s personal lives felt uniquely real, as though they had all worked together for years. The director’s sewing machine has created a seamless garment of humanity on the Dorset stage. 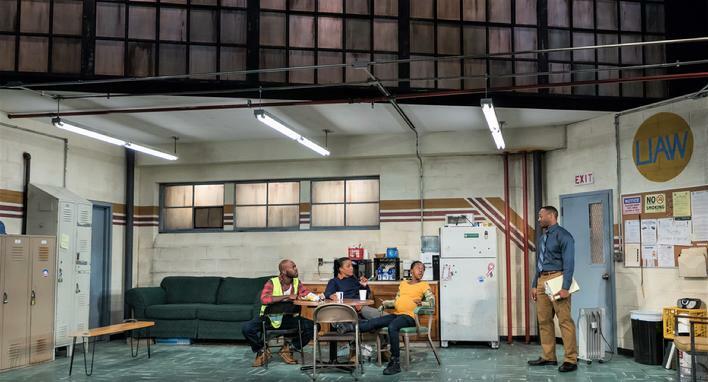 This takes place on a very realistic set designed by Kristen Robinson in ideal clothing for Detroit factory workers of a few years back designed by Alice Tavener. The lighting by Michael Giannitti gave us the time of day and night in this room, and the projections by Joey Moro greatly enhanced our understanding of the place and its functions. Again, seeing it for the second time may have made things clearer just because I was seeing it again. But somehow the newness of it is definitely due to the work being done in this particular production. This cast and director and these designers have created a unique opportunity to learn something while appreciating a work of art that illuminates our times. Skeleton Crew plays at the Dorset Theatre Festival, 104 Cheney Road, Dorset, Vermont, through Saturday, Aug. 4. For information and tickets, see the Berkshire Edge calendar, go online to www.dorsettheatrefestival.org or call the box office at (802) 867-2223 x101.